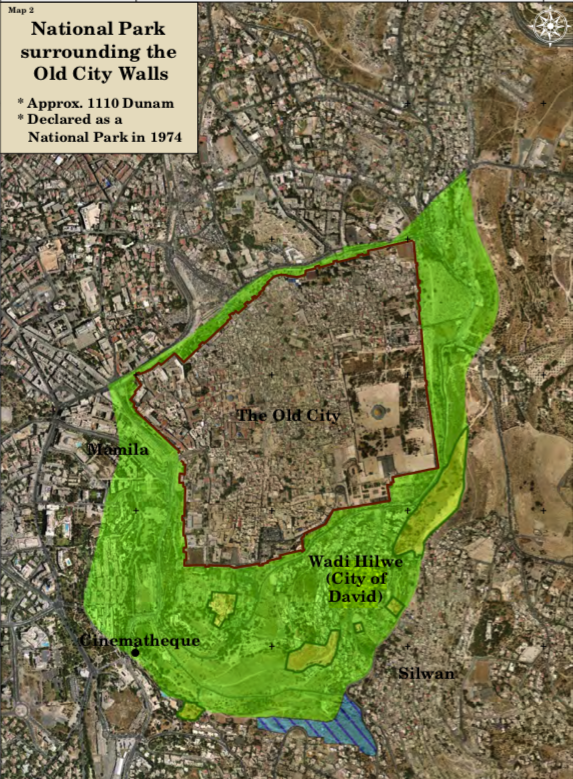 Ir Amim reports that the Knesset has advanced an amendment to the National Parks, Natural Reserves and Memorial Sites Law – last considered in July 2018 – that will allow the Elad settler group to build settlement units in the Wadi Hilweh section of the Silwan neighborhood in East Jerusalem, in an area which Israel previously declared the “City of David National Park.” On November 15th, the proposed amendment (Amendment 17) entitled, “Planning for Housing in an Existing Neighborhood in a National Park,” was moved to the Knesset Interior Committee in preparation for a combined second and third reading, after which it will become law. For more information on the role on national parks around Jerusalem in advancing the Israeli settlement agenda in Palestinian neighborhoods, see Ir Amim’s reporting here; for a comprehensive survey and analysis of national parks in Jerusalem/East Jerusalem, see Bimkom’s report here. A new Ynet report underscores the ideological significance of the Israeli government’s decision to approve plans for the first new government-backed settlement in 25 years, Amichai, which is currently under construction deep in the Shilo Valley. As a reminder, Amichai is one of two new settlements the government promised as a pay-off to Israeli settlers who were forcibly removed from the unauthorized Amona outpost, following a High Court order (an order the government tried to avoid enforcing). 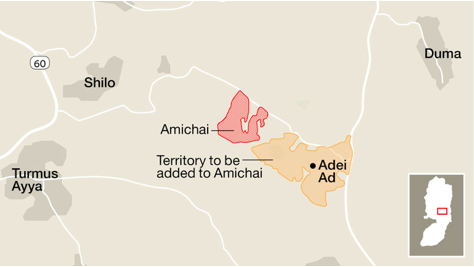 The plans for the Amichai were originally approved in April 2017; in August 2018, the Israeli government approved another plan that massively expanded the municipal borders of the Amichai in order to annex several outposts – including the notorious and expansive Adei Ad outpost – to the settlement, expanding its footprint three-fold. “Some three years before the evacuation of [the unauthorized outpost of] Amona, a group of us residents were sitting in the office of the Defense Ministry’s legal advisor, Ahaz Ben Ari, in the Kirya IDF base in Tel Aviv. To our west was the Mediterranean Sea, to our east were the mountains of Judea and Samaria. Ben-Ari looked east and said, ‘You do realize you’re living there temporarily, right?’ We asked him what did he mean—’you’re talking about our homes, our lives.’ He answered, ‘The international community won’t let us stay there forever.’ I told him someone greater than us (Israel’s first prime minister David Ben-Gurion) once said, ‘What matters is not what the goyim say, but what the Jews do.’ And we said goodbye. This is the common view among the Israeli bureaucrats who decide and run things. This is the view that uses life in Judea and Samaria as a bargaining chip on the way to an arrangement with the Palestinians. Life in Judea and Samaria is put on hold. That is why the construction is only done within the confines of the separation barrier. Americans for Peace Now has released a new and improved version of Facts on the Ground, APN’s smartphone app that gives users the ability to track, explore, and gain a comprehensive understanding of the settlements.